Brighten up your space with this cheerful blue picture frame. We love this frame for corkboards or whiteboards to keep the family artfully organized and for rustic landscape paintings. It features a 2” profile with distressing on the rounded edges for an added touch. Hand-crafted from eco-friendly upcycled wood fiber by pictureframes.com Artisans. It’s an exceptional everyday value that helps save the Earth while you save some money. I would highly recommend this frame for a lot of your paintings. Great frame really happy with. This is a really nice frame. Mine was large 19 x 26 and I got a double mat that was 2" which was perfect. I got the UV but its not non-glare so if I had to do it over again I would have gotten the non-glare. Very pleased. This frame makes the original photograph shine! I am 100% pleased with the frame. In fact I ordered 2 of the American Blue frames and was totally impressed how they were shipped together and perfectly made. I would recommend these frames without hesitation. Hello Lazaro! Thank you for placing your most recent order. We regret that one of the frames and the Mats were not in perfect condition. We are happy to replace those items for you at no cost. We want you to experience the excellence that we can provide. At your convenience, please email us photos of the Mats and the frame that have the issues. Please email the photos to customercare@pictureframes.com- Attention Shea. We will make this right with you! Have a great day! I have country French prints that include sunflowers. I think the vibrant blue frame will go great with the shades of blue and yellow in the bedroom where the prints will be on display. Purchased as a gift to frame a new journalist first newspaper article. I chose this frame because hopefully it goes well with my Star Trek print which I received from attending the Star Trek cruise this past January. Thought it went well with the blues in a sunset photo of a sunflower field. It would bring out the blue in the artwork. Blue is a dominant theme of a farm painting - blue sky, blue snow shadows, distant blue barn. fits in with the contemporary design of my home. What is the rabbitt depth? I have a 11/2 inch canvas painting. BEST ANSWER: Hello Jeanne! 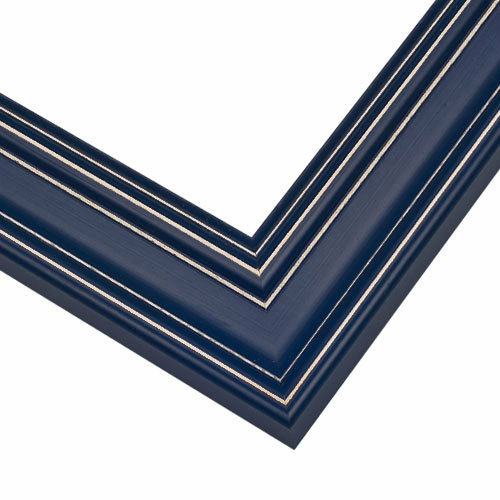 This frame has a rabbet depth of 3/8", which will not accommodate your 1 1/2" canvas. Each of our frames have a diagram listed below them that show the rabbet depth of it. This can help ensure your canvas will fit nicely inside the frame. Additionally, our framing experts are always happy to help you search and find the perfect frame for your artwork. They are available Monday-Friday 8am-7pm eastern standard time and can be reached at 1-800-332-8884. Happy framing! That info is contained in every frame listing if you click on the frame. It 3/4 inch, not for canvasses. Sorry, I've sealed the frame with a photo so I can't measure but it's quite shallow. about 3/8" if I remember correctly. frame says minimum size is 5" my print is 4" . but I also want to add a matting which increases frame size to 5" . is it possible to make the matting 4" so the frame can remain 5"? BEST ANSWER: I love the frame but I put a large poster size print in it with a double mat I think something like 24 x 32 or even larger and its great. It is 2 inches wide so I am not sure how it would look in a smaller frame. My poster was very colorful and the bue is really nice. Nice quality and I would buy it again and plan to frame other pictures. I don't think I will ever go to a frame shop again. For items which are less than 5" which you intend to add matting to, the order would need to be placed by phone at 1.800.332.8884. We are available between 8a-7p eastern standard time Monday-Friday. We look forward to hearing from you. As always, happy framing!